Now take stones, my hobby, view them microscopically, and you’ve got Chemistry. So now I have started “collecting the Elements”, and so far have got: C,Al,Fe,Na,Ag,Cu and Pb. 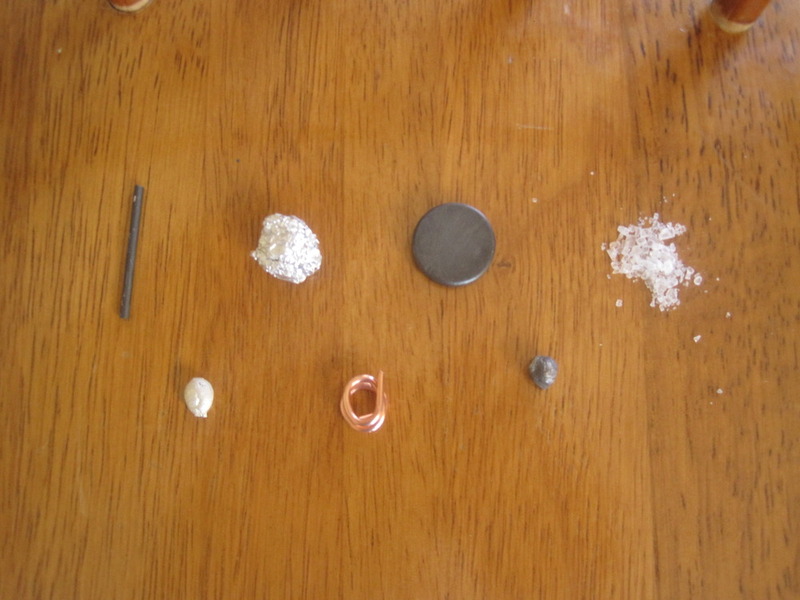 In case you forgot your Chemistry, that’s Carbon (Graphite from a pencil), Aluminum, (Aluminum foil), Iron (a magnet), Sodium (kitchen salt) Silver (leftover silversmithing scraps), Copper (wire), and Lead (fishing weight). In 1789, Antoine Lavoisier published a list of only 33 Chemical Elements, less than half of the 102 currently known Elements. But it was in 1869 and 1870 that Dmitri Mendeleev and Julius Meyer published the first Periodic Tables. This entry was posted in Uncategorized and tagged 1800s, Chemistry on August 29, 2011 by Captain Belaq.